What a great week we've had, we've managed to interview 19 people for our oral archive. We've met such a range of people from Bishops to Poets and even a woman who was blessed by a Pope who then became a Saint! The research team have been amazing, the quality of the interviews are outstanding, they've managed to put our interviewees at ease to gain some really emotive and interesting memories, insights and anecdotes. I'm really looking forward to another week of interviews where we have already managed to book in another 19 interviews so far. The training is over and now the hard work begins as we start to interview. It is our aim to interview 50 people who have a connection to the 50 year heritage of The Metropolitan Cathedral. These interviews will then be archived and some highlighted edits will form an intriguing audio trail which will launch along Hope Street in the middle of May. On Monday the research group carried out 3 interviews starting off With Dr. Williams who had been a local resident for over 40 years and had a vast knowledge of the historical landscape. The group then interviewed Dermott O'Connor who had met the Queen when she visited the Metropolitan Cathedral in 1991. Dermott had a range of memories, anecdotes and also brought along a fascinating scarp book. Our day finished with a very engaging interview with Spencer Leigh from BBC Radio Merseyside who shared numerous anecdotes from Liverpool's cultural scene in 1967 the year the Cathedral opened. I've just got back from the Papal visit debate and i'm full of emotions. The afternoon started with a presentation from Maria O Reilly an activist who lived and worked in Liverpool 8. Maria spoke passionately of her personal involvement in the 1981 riots which took place in Toxteth one year prior to the papal visit. Her insights gave a cultural and political context to the papal visit so that we could understand just how much more significant the papal visit was to the city of Liverpool. Father Nick then spoke about his work in the community when he arrived to live in Toxteth during 1971, his presentation really highlighted the importance of working within the community. The second part of the debate then investigated the Papal Visit itself. Starting off with Myles Davies who represented the Anglican Cathedral, his anecdotes involving his rather persuasive mother offered a great insight to the significance of the papal visit for all faiths and are certainly something that we will seek to capture when we interview him in the next few weeks. Angela OBrian then spoke about how she was a young steward at the papal visit and was unbelievably blessed by Pope John Paul II. This was a fantastic anecdote which really showed the power and importance of the papal visit on the young people of Liverpool. Canon John Furnival was next to speak and he really introduced to the group how the papal visit was so close to being cancelled and the context surrounding the visit regarding the political backdrop and therefore the increased security required. Canon John Furnival also provided some wonderful anecdotes regarding the pope's bed and the pope's hearty breakfast! The session ended with a wonderful presentation from Bishop Malone who was incredibly involved with the papal visit. Bishop Malone spoke of the mass that took place in the piazza, the address at Speke Airport, the procession along Hope Street alongside many other key moments. The research group have learnt and gained so much insight by this sessions and we all simply can't wait to interview our wonderful panel. This was our last debate and what a debate to end with. Well Today our research team was introduced to the technical equipment that they will be using to conduct the 50 interviews. The session started with a presentation on how to conduct an oral archiving interview. Top tips included the use of open questions, how to put your interviewee at ease, noise pollution issues, consent forms a good fail safe check list. Paul Long then took over to go through the recording equipment the team will be using. The group then had the opportunity to get familiar with the equipment and I have to say although at first there was some nervousness by the end of the session we had certainly found a few key technicians within our group. I can't believe our interviews start on Monday, the training period has flown by and what an amazing group of volunteers we have! Today the research group had a fantastic morning at Central library. The morning started with a tour of the Central Library taking in the wonderful Picton reading room The Hornby library and The Oak Room which took everyones breath away. Jan from the library team then took us into the archives where we were shown the conservation room where some of their collections are painstakingly restored to their former glory. Then we were taken into one of the depository rooms where we were shown a beautiful water colour painting of St. Georges Hall and the surrounding buildings alongside some haunting WW1 recruitment posters. The group was then lead back into the research room where Jan had displayed some incredible artefacts related to our project. 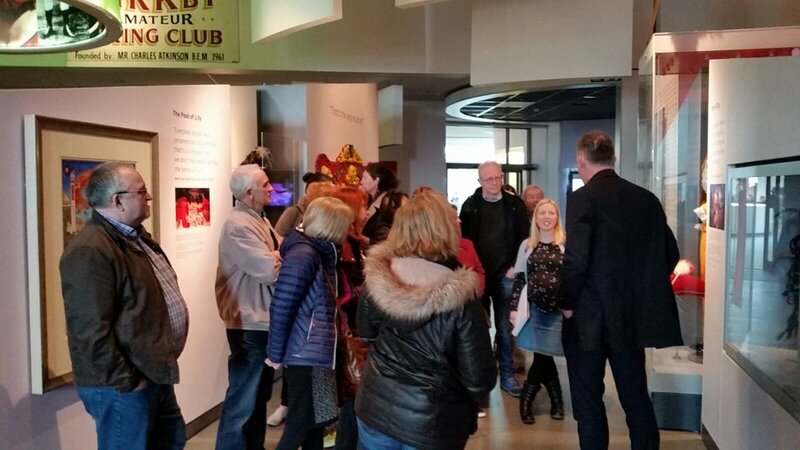 The group were able to see a selection of construction photographs, old copies of the Catholic Pictorial and the 1967 edition of The Echo featuring the reports on the opening ceremony. Finally the group was then shown how to access the national newspaper archives as well as the local Liverpool newspaper archives held on microfilm. It was an absolutely packed morning of activities and has given us a huge list of research jobs! Mike Brocken and Ron Ellis then joined Spencer Leigh and the event became more of a debate. Mike Brocken was keen to point out that Liverpool was a very conservative city and the avant guard scene was a very discrete minority with the majority of Liverpudlians being pretty unaware of the so called "Summer Of Love" Ron Ellis, a music agent in the 1960's highlighted some great venues and bands which portrayed the diversity of Liverpool's music scene during 1967. Our research group then asked a number of very interesting questions, we discussed the issues and merits of oral history when trying to research accurately, which was particularly thought provoking. The research group then broke off into small groups and decided areas of interest and potential questions for our Summer Of Love theme. Tomorrow we head to the Central Library to discover how to access their archive and to start our desk based research! On Friday we had a fascinating guided tour of the Metropolitan Cathedral. There was a fantastic turn out once again from our volunteers who are the research group for this project. The group were treated to a tour of both the Crypt and the Cathedral and our knowledge is certainly growing. Highlights of the tour included the Rolling Stone which guards the Chapel of Relics, the gold chalices which were made from donated wedding rings and the sheer scale of Lutyens original design for Liverpool's Cathedral. After our tour we discussed a range of questions we could ask our interviewees regarding their opinion on the modernist design created by Gibberd. It was great to hear everyones opinions and due to demand we will be repeating this session on Monday 20th February at 10.30am, so if you couldn't make it on Friday do come along on Monday. We had a great day searching the Metropolitan's Cathedral's archive, a real treasure trove of images and information. We've managed to collect a great range of photographs on the opening ceremony and the Papal Visit, alongside some fantastic photographs of the construction of the Cathedral. A real find was a collection of letters and documents on the competition held to create the new design for the Cathedral and it was fascinating to see some of the other designs put forward. We'll be back in the archive in a couple of weeks to see what else we can discover!